The ten days referred to here, are the ten days lost in 1582 when the calender was revised by Pope Gregorius XIII. The concept at work here is the 'uselessness of time calculation compared to the precision of time itself'. Telepherique are of course main players in the underground for many years, releasing a wide stream of CD-Rs, CDs and vinyl. Maurizio Bianchi was one of the main players of industrial music as MB, but in 1984 he left music suddenly. All of his previous records from the early 80s have been re-issued and are a must have. His return however didn't bring much interesting new music, at least what I heard of it. It's interesting to notice that this new CD is Bianchi's first collaboration ever. From purely judging from what I hear, is that Bianchi has made ten different sound pieces in his recent, more new agey style of synthesizer playing: the area that I didn't find of much interest in his recent music. But the addition of more synths, guitars and slow percussion really lifts this music up and actually makes it quite enjoyable. Slow peaceful music, with the new age element a bit removed, or say, enhanced. 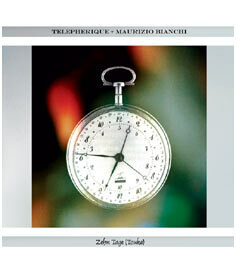 More to the credit of Telepherique than of Maurizio Bianchi, I think.